If you are accessing a POP account (this is most likely, and is the case if your email account is neither a Hotmail nor an IMAP account) and have set it to keep mail on the server, at least for some time, the reason for the malaise may be a hiccup in the file that keeps track of the messages already downloaded. Open your Outlook Express store folder in Windows Explorer. Click on the file named “Pop3uidl.dbx” with the right mouse button. Since Outlook Express has just lost even the rest memory of which mail it has already seen, expect all mail still on the server to be retrieve the next time you click Send/Recv. After that, mail retrieve should return to normal, however. 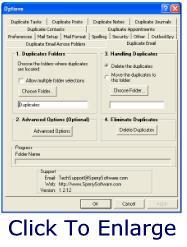 All duplicates already received can be eliminated fast with a duplicate removal tool.